Does British ice hockey have a homophobia problem? I think it is fair to say that British Ice Hockey (the sport, not the website) seems to lurch from one controversy to another on what appears to be a weekly basis. There always seems to be some kind of incident that casts a shadow over the positive stories, no matter what. Yup. Once again, David Simms, the “Voice” of the Steelers (and so he would have people believe the sport as a whole) puts his foot into his rather large mouth. Now, you would like to think that after over 20 years of being on a live mic in front of large crowds, he would have learned to take a second before opening his mouth and speaking. But no. That isn’t Davids style. Now, clearly plenty of people just took this to be a “joke”, but equally so, plenty didn’t. They took it to be homophobic. And it is. Even if it was said in jest, it betrays the persons thinking. Now, that there was a degree of uproar on social media is to be commended. It shows that ther are plenty of good people out there, who understand that comments such as Simms are unacceptable, irrespective of any supposed context. Of course, that wasn’t the end of it. Oh no. Now, as is often the case, this simply made those who were offended (such as myself) even more determined to see that he be held accountable for his actions. So we awaited the response of his employers. And we waited. They tweeted! Finally! About their kit man drying the kit. Seriously. Social media was blowing up with condemnation, and they chose to tweet about their kit. Anyway, they eventually responded with a bizarre “apology” of their own. They didn’t apologise for the comment being made, that would be too simple. They apologised for the offense it caused. And made reference to a seemingly made up LGBT charity: LGBT Direct, with whom they had apparently been in contact with. Which was strange. Anyway, any hope they had of this just blowing over dissapeared once Puck Daddy on Yahoo Sports picked up on it. As did Peter Thatchell, the noted LGBT activist. Oooops. This didn’t seem to deter the Steeelers though. Their response to an email sent to them actually stated they wanted to keep it out of the public domain. Didn’t work. Following a frankly embarrassing fluff piece in the local rag, and a truly odd video “apology”, the Steelers eventually released a proper, well written statement about the incident. it condemned the incident, and spoke of re-education for Simms. Sadly, I don’t think this will happen, as Simms is apparently a law unto himself. WHat this whole incident did do, though, more than anything else is expose the rampant homophobia in the sport. 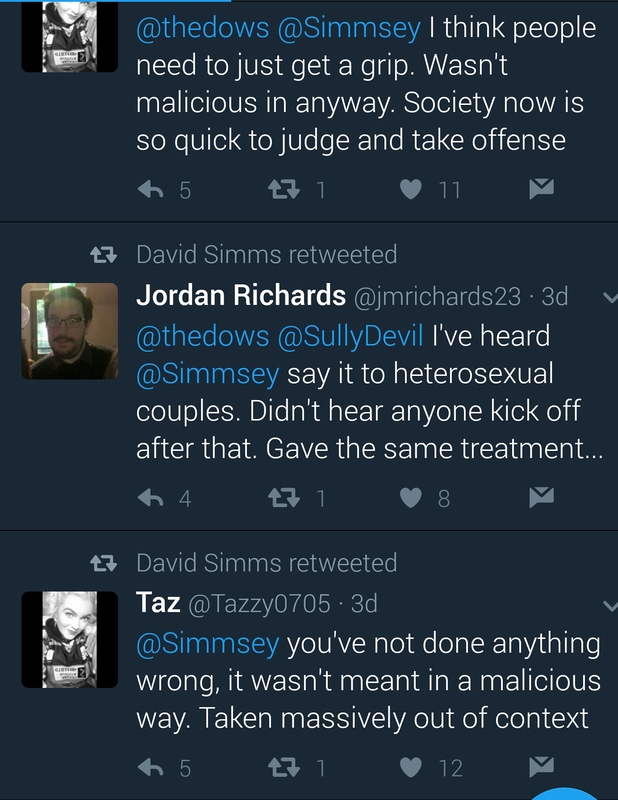 The sheer number of fans who were prepared to defend Simms, and openly attack anyone who objected to his vile “joke” was staggering. As was some of the abuse they dished out. 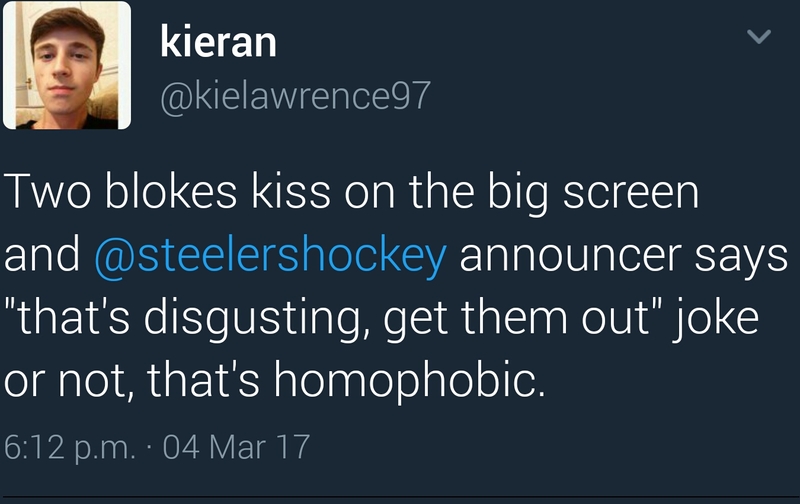 Not only that, but despite their best efforts, the whole Steelers organisation was made to look homophobic when the deputy editor of the Gay Times uncovered a series of tweets on Simms timeline which used homophobic language as insults. But how did this make the Steelers look homophobic? Well, rather than respond like you would expect and take further action against Simms, they simply blocked the guy on Twitter so he couldn’t keep reminding them of their complicity in promoting homophobia. Classy move, eh? Now, I’m not going to say that Simms and his vile attitude are responsible for homophobia in the sport. That would just be stupid. However, his public actions and the seeming inaction of his employers do serve to exacerbate the problem. When someone in the public eye is seen to act in a certain manner without apparent censure, it “normalises” that behaviour and empowers others to feel that they can act in the same manner. Credit must go to the Cardiff Devils, Nottingham Panthers, and Fife Flyers, who all made gestures to support the LGBT community in the fall out from this frankly embarrassing incident, but you have to question why the other clubs have remained silent. And the league itself (EIHL) said basically nothing, nor did they appear to take any action. Perhaps the cancer runs deeper than we think. Or perhaps they just don’t care. Either way, this is an issue that isn’t going to go away any time soon.